Note: Today a knowledgeable food writer tells us about a new memoir by a chef who is also a writer who travels through kitchens of New York, France, Greece, Turkey and Italy. Good for traveler’s to New York or those who want to know more about Italian cooking. Even if you’ve never set foot in New York City restaurant, Prune, Gabrielle Hamilton‘s effortlessly charming and minuscule place on East 1st Street in Manhattan, the kind of place for which the adjective “jewel-box” was created–even if you’ve never sucked down a gin martini at its zinc bar or let a few drops of anchovy butter drip from a grilled head-on prawn onto the brown kraft-papered wobbly table, Hamilton will feed you a meaty tale via her memoir, Blood, Bones & Butter . It’s a journey through her physical worlds—the lamb feasts and cool Pennsylvania streams of her childhood, the not-yet-gentrified downtown alleys of Manhattan, the uneasy family trips to Italy, where years of tradition weigh a bit too heavy on a woman still wrestling with the idea of marriage —but also through the mind of someone who is fated to cook. She asks the question those of us who find ourselves baking cakes in 90˚ heat at midnight– who routinely end up with mountains of plates, bowls, beater blades, and skillets from yet another culinary experiment, wrestle with: “Did I have something in me other than dishwasher?” Don’t fret if for you, unlike me, the answer to that is no. Keep reading Blood, Bones & Butter and slowly savor the meal in front of you while the rest of us do the dishes. Hamilton recounts her bohemian childhood in New Hope, Pennsylvania, which abruptly ended when her adored French mother, from whom she learned to cook and who gave Hamilton the nickname “Prune” (French for “plum”), abruptly leaves the family for rural Vermont and all kids and parents scatter like marbles across the globe. As an adult, Hamilton creates the restaurant Prune to “harness a hundred pivotal experiences relating to food—including hunger and worry—and translate those experiences into actual plates of food.” For anyone who’s ever arrived hungry, tired, thirsty, and even bedraggled by travel and the woes of the day, Hamilton serves up plates and atmosphere that epitomize the warm and unquestioning hospitality of simply good dishes. In Prune’s first year of business, in walks a stubborn Italian, who—as Hamilton says—was first seduced by the food and the “insouciant female energy” of Prune and, in a The Kids Are All Right-style twist, ended up seducing Hamilton away from her girlfriend for marriage and kids. But like the Negronis she and husband Michele drank in the early days of their affair (and the description of which made this reviewer reach anew for the Campari bottle, so enticing is their call), Hamilton’s marriage immediately finds itself in a balancing act between bitter and sweet. She struggles with her increasing isolation from her husband while falling deeply in love with his family: namely, his Italian grandmother, Alda. Alda’s culinary gifts are the type of Italian grandmotherly talents that seem so exquisitely rustic that they must be fictional, but which anyone who’s eaten great Italian cooking knows to be no exaggeration. So what if she stores food unrefrigerated in the cupboards of the family’s villa in Puglia? She and Hamilton, who speaks very little Italian, “talk” through cooking, wordlessly sharing and tag-teaming ingredients. With each successive trip to visit her Italian in-laws, Hamilton’s desire to become familial and to please the clan with perfect dinner party, recapturing the expansive, welcoming lamb feasts of her youth and the “salty, sweet, starchy, brothy, crispy” simplicity of meals at Prune, becomes all-encompassing. 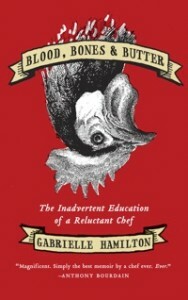 Hamilton’s search to quell her hunger and find satisfaction drives the heart of Blood, Bones & Butter. Whether she’s looking for the perfect ratio of meat to butter in a simple prosciutto sandwich or searching for a family with arms outstretched to welcome her “since my own family evaporated, years ago,” Hamilton’s story unlocks a deeply abiding yearning. Her well-written story comes from that same place, from a cook’s desire to share and please others in very basic terms. And like the best chefs and storytellers, she always leaves you wanting just a bit more. Casey Barber is the editor of the online magazine Good. Food. Stories. and a freelance food writer/recipe developer who has written for ReadyMade, Time Out New York, and other print and online publications. Prune is one of her top five favorite restaurants in New York City. Thanks, Casey for introducing us to this fascinating memoir about food from different cultures and the life of a chef. Readers, be sure to check out Good. Food. Stories. for some of the best food writing you’ll see anywhere. The book title is linked to Amazon for your convenience. If you click through to Amazon and purchase anything at all, I get a few cents which helps support A Traveler’s Library. Thanks. Do you have a favorite chef’s memoir? What makes it special? Read the book. Have things to say about it myself, coming soon. Appreciated your thoughtful take here. Mostly, though I just want to go have a meal at Prune with you. Are we on? Pingback: Good. Food. Stories. Gets Around—Stories Elsewhere on the Web – Good. Food. Stories. Fascinating stuff, and I love that she weaves her life with food into a memoir. It’s all mixed together, like a yummy recipe. also love the name Prune. I’m in NYC and not only have I never been to Prune but I never heard of it. I’d like to go there for lunch tomorrow. Ooh, this sounds like it’s right up my alley! Thanks, everyone! I hope the book lives up to your expectations… and if you’re ever in NYC, let me know and we can have a drink and a nibble at Prune. I’ve heard a lot about this book, the chef and the restaurant. I loved reading this review! I’ve read a few reviews of this book, all of them well-written and informative, but this is by far the best. Thanks for all the color and insight here. I’ll be downloading the book on my iPad. I’ve had the odd waft of this book, but now I’ve really caught the scent. Thanks Casey! Reading this not only made me drool for this restaurant, but for this book, as well. Both sound terrific! i can’t WAIT to read this book – i’ve had it on my TBR pile since it came out. i think casey just pushed it to the front! thanks!